The Wild Atlantic Way is the main draw to Ireland and it is a highly ranked west coast road trip. Locations like the Ring of Kerry, the landscapes of the Connemara, or the mighty Cliffs of Moher. * 2017, ‘Best International Self-Drive Route’ category at Shangai Awards ceremony organised by HuiZuChe. * 2018, ‘Best Self-Drive Holiday Destination’ Award In China. The route starts in Kinsale along the western coast to the most northerly point of Ireland, Malin Head. Covering all the popular and hidden gems. The Ring of Kerry, Dingle, Cliffs of Moher, Skellig Michael, Aran Islands, Slieve League and many more. Wild Atlantic Way offers literally every activity you can think of! So pick up a car hire Dublin Airport upon arrival and hit the road! You can easily arrange a one way rental for convenience and a hassle free road trip experience. Enjoy a complimentary Wild Atlantic Way eBook from Irish Car Rentals - Free download! These are the most popular areas of the Wild Atlantic Way route and destinations highlighted on Europcar’s Tourism Index. This gives a snapshot of West coast road trip itinerary and what Ireland has to offer during road trips! Shannon Airport car hire or Galway. 1. Start at Westport, exploring this heritage town filled with Georgian buildings. 2. Head towards Croagh Patrick, considered as Ireland’s 3rd highest and holiest mountain overlooking Clew bay. 3. Hitting next is the Connemara countryside, “experience the real beauty of Ireland” and drive around off the beaten track; Killary Harbour, Kylemore Abbey Monastery, Clifden, Roundstone and Rossaveal for ferries to Aran Islands. 4. Head towards Galway for a browse around the city and drive to visit to Cliffs of Moher. 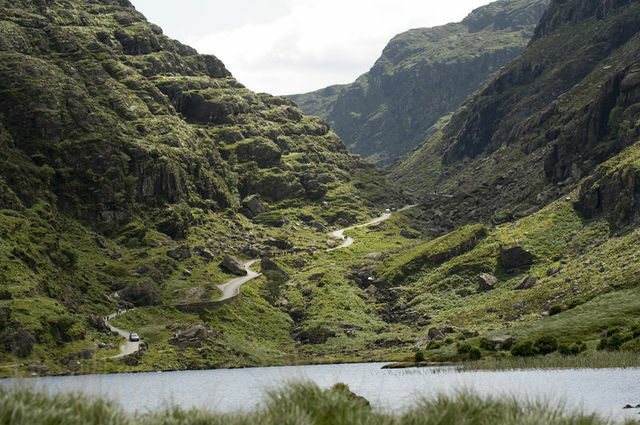 Driving the Ring of Kerry deserves a full day of its own to explore this beautiful drive. So rent a car and take your time to enjoy the scenic beauty of Irish countryside. Try leave early to avoid the crowds & tour buses and following this Ring of Kerry itinerary. 1. Starting in Killarney and head towards Killorglin stopping at Gap of Dunloe. A narrow mountain pass between MacGillycuddy’s Reeks and Purple Mountain – wonderful views! 2. Continue towards Cahersiveen – Valentia Island lying off the Iveragh Peninsula. Skellig Ring where you get breath-taking views of Skellig Michael. 3. Continue on to Ballinskelligs beach, Kenmare to stop at Ladies View panoramic viewpoint and visit Torc Waterfall. 4. Finishing up at Muckross House and Lakes in Killarney. 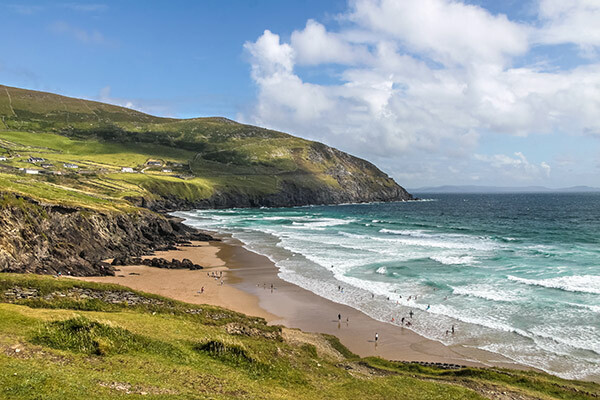 This 3 days west coast Ireland itinerary takes you through Co. Kerry and the famous Dingle, Ring of Kerry and North Kerry Head peninsulas. These are ranked as some of Ireland’s most dramatic countryside, while trips to Slea Head, Valentia Island and the Skellig Islands are worth the effort. 1. Starting from Dingle, drive towards Ventry and Dunbeg Promontory Fort for a stop. 2. Continuing onto the beehive huts used by early Christian settlements. 3. From here, drive to Dunquin where you’ll find a unique Dun Chaoin Pier and scenic view of Blasket Islands. 4. Finishing up the day and drive to Killarney for the night. 2. Continue towards Caherciveen – Valentia Island lying off the Iveragh Peninsula. 3. Stopping at Portmagee overnight. 1. Skellig Ring where you get breath-taking clifftop views of Skellig Michael. The Skellig Ring Drive is a small section south of the Ring of Kerry drive with beautiful views. 2. Continue on to Ballinskelligs beach, Sneem, Kenmare to view Molls Gap, Torc Waterfall and Ladies view panoramic viewpoint. 3. Completing the trip at the Muckross House and Lakes in Killarney. An off beaten track of the Wild Atlantic Way, entering Donegal, you’ll be in the northernmost county in Ireland. 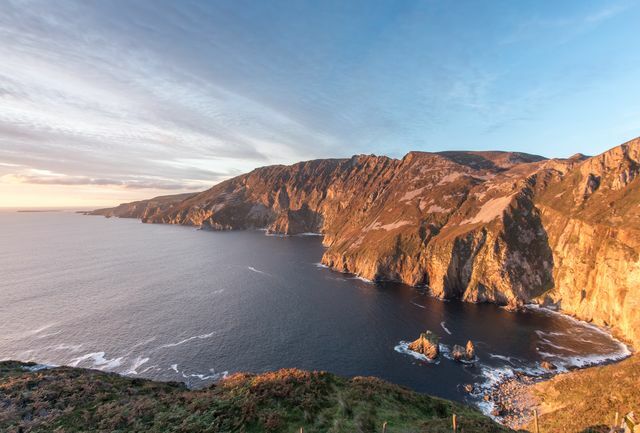 Among County Donegal’s natural wonders are the highest sea cliffs in Europe, known as Sliabh Laig, the picturesque Malin beg beach and the stunning viewpoint at Mamore gap finishing up Ireland’s most northerly point, Malin Head. This driving itinerary is well worth taking on! 1. With Sligo as your starting base, drive to Mullaghmore for the beaches and coastal views of Slieve League Cliffs. Surfing and horse riding are popular activities here. 2. Then head towards Slieve League, the highest cliffs in Europe with breathtaking views! Driving down to Silver Strand beach at Malin Beg for a spot of lunch and stop overnight in Ardara. 1. Start your day with driving along the coast to Dungloe where you’ll find fresh seafood and pick up a picnic to stop for lunch in the hidden gem of Glenveagh National Park. Here you can spend most of the day easy hiking to different wilderness viewpoints, lakes and enjoy their castle grounds. 2. Afterwards, drive up to Horn Head loop. 3. Then head to Fanad Head for spectacular Atlantic seascape and doing a guided tour is highly recommended. 4. Stop overnight in Letterkenny, the heart of Donegal. 1. Leave Letterkenny to visit ancient ruins at Grianan of Aileach, a ring stone fort with 360 degree views, this is worth adding onto your itinerary! 2. Afterwards, drive up to Mamore Gap for the scenic Irish countryside and coastal views of Donegal. 3. Continue north to explore the northernmost tip of Ireland at Malin Head. If you wonder what is there to see in Ireland in 7 days, there is a bit of everything to experience. On this itinerary is the culture, history and the beautiful Irish countryside. All within a few hours of each other making this an epic 1 week itinerary of what Ireland has to offer. Travelling from vibrant Dublin City Capital, to Kilkenny and the must do Ring of Kerry drive for Ireland’s most rugged landscapes is definitely worth the time to travel. 1. Start the day with a full hearty Irish breakfast, Dublin offers plenty of wonderful cafes with good food. 2. Head to Trinity College ground & visit the Book of Kells early to beat the crowds. The Book of Kells is an impressive collection of artefacts and books – a definate photo opportunity. 3. Visit the Little Museum of Dublin for a guided tour on Irish history of Dublin in a modern way with interesting rooms – book before you go. 4. Grab some fresh air in St Stephens Green Park, this is opposite the museum. 5. 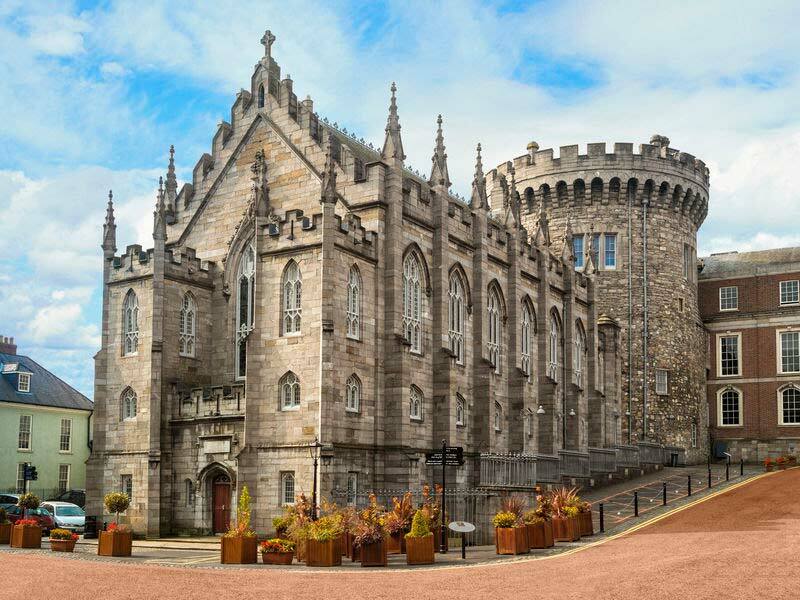 Head towards Dublin Castle for a browse around the grounds and grab a coffee to relax in their pretty Celtic gardens. 6. If visiting the Guinness Storehouse tickles your fancy, grab a bus and spend the afternoon learning how Guinness is made. Do check out their marketing floor and have fun pouring your own Guinness then enjoy 360 rooftop bar views. If you book online, you’ll save a few bob. 7. Wind down the evening with live trad music in the Temple bar. 1. Leave Dublin early morning and drive down to Wicklow, known as ‘Garden of Ireland’. 2. Stop at Powerscourt House & Gardens first, enjoy their well-maintained gardens; Japanese gardens, Rose gardens and full blooms with Sugarloaf mountains in the backdrop. 3. Continue onto Glendalough Monastic site for the historic tour around the ruins, burial grounds and round tower. Not only they have history, there are absolutely stunning walks/hikes around the lakes or mountaintops. Bring a picnic for a lunch stop here. 4. Drive to Kilkenny, a medieval town built in 1195, use this afternoon to enjoy the small city with lots of medieval alleys – Butter slip. The main attractions are the Kilkenny Castle in the centre and soak in the atmosphere in the traditional pubs favoured by the locals such as Tynans Bridge House bar. 1. Take a morning stroll to St Canince’s Cathedral and Round Tower, built between 1202 and 1285. Climb up the 9th Century Round Tower for the city views. 2. On the way to Cashel, take a detour to a hidden gem; Jerpoint Abbey. A ruined Cistercian abbey founded in 12th century. Take a tour to learn about the interesting on early monastic life and photographic views. 3. Drive to the next stop, Cashel a home to iconic Rock of Cashel. The 13th Century Gothic Cathedral is located on a prominent green hill circled by rock walls, offering fantastic photo opportunities of Tipperary countryside. A guided tour is highly recommended to capture the history behind the cathedral, chapel and cemetery. There is another abbey that is off the beaten path with free admission, the 13th century Hore Abbey where you can walk around this place peaceful without large number of tourists. 4. After lunch, drive to Cork City stopping at the pretty Swiss cottage in Cahir. 5. Stop in Cork City for two nights. 1. Start with the day with breakfast in The English Market in a beautiful old building with fresh produce stalls and a café on the balcony upstairs. This is also a great place to create a picnic for your lunch later. 2. After, have a stroll through the City and explore what Cork has to offer; Cork Gaol, St Anne’s Church and more. Spend the afternoon visiting Spike Island complete with a rich history and a ferry from pretty Cobh harbour. Spike Island is a natural harbour that has been a monastery, a fortress and a prison over the years! Walk around the perimeter of the fort and enjoy views of Cork Harbour, visit the old prison rooms, punishment quarter and the fort. 3. Back on the mainland, explore Cobh, pretty village and also has history with Titanic. 4. Head back to Cork city and wind down in Sin e, a traditional Irish pub with live music and cosy atmosphere. 1. From Cork City, drive early to Blarney Castle, firmly on the tourist trail however a lovely castle to visit. 2. Explore the beautiful gardens and waterfall, climb up the stone spiral stairs to kiss the famous Blarney Stone. 3. Afterwards, take the N72 to Killarney where you will explore Killarney National Park and the famous Ring of Kerry for a couple days. 4. Starting in Killarney and head towards Killorglin stopping at Gap of Dunloe. A narrow mountain pass between MacGillycuddy’s Reeks and Purple Mountain for wonderful views. Perhaps take a horse cart trip down the gap. 5. Continue towards Cahersiveen and Valentia Island – explore Geokaun Mountain and Cliffs. 6. Stop overnight in a picturesque fishing village, Portmagee. 1. From Portmagee, join the Skellig Ring where you get breath-taking clifftop views of Skellig Michael. 2. Continue on to Ballinskelligs beach, Kenmare to view Torc Waterfall and Ladies View panoramic viewpoint. 3. Finish up at Muckross House and Lakes in Killarney. 1. Departing Killarney for a long drive back to Dublin. If you are dropping off your car hire Dublin Airport, follow the signs to Dublin Airport on the M50 motorway and take the exit 2 from M1. Please be advised this route has a toll. It is possible to do a best of Ireland self drive tour in 7 days. This road trip Ireland suggestions delivers experiences on; culture, history and nature scenic drives through Irish countryside, all within a few hours of each other. Starting from Dublin to Galway, the lesser known destinatinon; Connemera to Westport and explore Achill Island. This is the trip to do and worth the hours behind the wheel. 2. Head to Trinity College ground & visit the Book of Kells early to beat the crowds, the Book of Kells is an impressive collection of artefacts and books. 3. Visit the Little Museum of Dublin for a guided tour on Irish history of Dublin. Book before you go. 4. Grab some fresh air in St Stephens Green Park opposite the museum. 5. Head towards Dublin Castle for a browse around the grounds and grab a coffee to relax in their pretty gardens. 6. If visiting the Guinness Storehouse tickles your fancy, grab a bus and spend the afternoon learning how Guinness is made, check out their marketing floor and have fun pouring your own Guinness then enjoy 360 rooftop bar views. If you book online, you’ll save a few quid. 1. Depart Dublin to visit a well-preserved ancient monastic history and a guided tour in Clonmacnoise. 2. Then head towards a coastal village of Doolin for lunch before visiting the famous Cliffs of Moher. Spend a good bit of time here admiring the Atlantic views and a spot of hiking along the clifftops. 3. Stop overnight in Galway. 1. Starting off the day with breakfast in Galway and stroll through the Latin Quarter & city. 2. 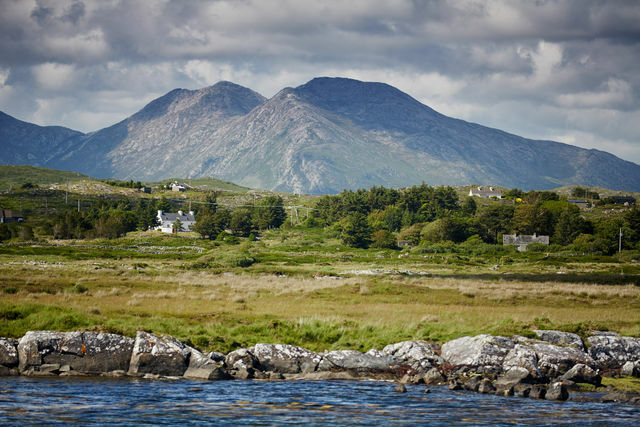 From here, spend a full day driving around in the Connemara National Park for remote wildness and natural beauty. 3. Start driving towards Carna stopping at Spiddal Village overlooking Galway Bay. 4. Continue on to Roundstone and then onto Clifden – the starting point of the Sky Road route providing panoramic views of the bay and islands. 5. Once back in Clifden, drive to Recess to join the Lough Inagh Valley roads through picturesque lakes to Leenane. 6. From here head back towards Galway through Maam Cross and Oughterard. Just take your time and enjoy driving through Connemara and pull up anywhere for a picnic! 7. Stop overnight in Galway. 1. Head towards Croagh Patrick, considered as Ireland’s 3rd highest and holiest mountain to a height of 762m above the sea level overlooking Clew bay. Spend a half a day climbing to reach the summit & descend, it is advisable to bring sturdy footwear and thin layers of clothing. 2. After descending, enjoy the afternoon relaxing in traditional pubs of Westport. 3. Stay overnight at Westport. 1. Spend a full day driving the 121km Achill drive on Achill island and stopping at all these places, Westport - Mulranny - Achill Sound - Dooega - Keel - Dooagh Keem Bay – Dugort. 2. Leaving Westport early morning and drive along the scenic coastal road towards Mulranny. 3. Continue to Achill Sound village and connecting bridge to the island. Look for signs for ‘The Atlantic Drive’, on the drive you’ll be overlooking the Atlantic Ocean and fantastic scenery as you drive around the coast. 4. Stopping at Dooega for a panoramic walk through the fishing village and enjoy their blue flag beach. 5. Continuing the remote drive to Keel for another 3km sandy beach and surf the waves. Further up is the stunning Keem Bay, not to be missed – a perfect horseshoe bay of bluey green sea with mountaintops backdrops. 6. Drag yourself away from this spot to drive on to Dugort and Minaun Heights for a superb panoramic view from the top overlooking Keel and Slievemore mountain. 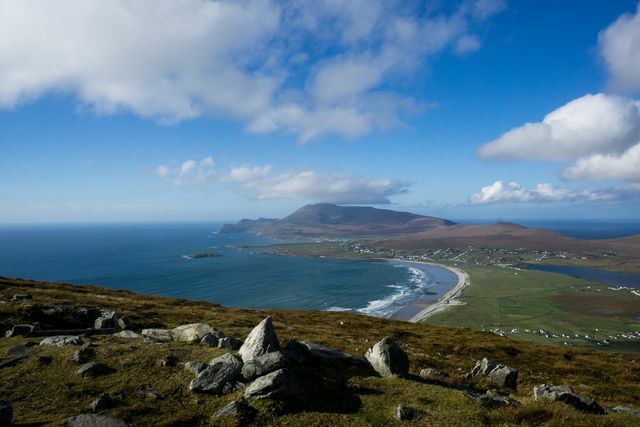 Take your time on Achill Island – it’s stunning. 7. Stay overnight at Westport. 1. Use this day to relax and explore this small heritage town, there are a range of activities to enjoy. 2. Stay overnight at Westport. 1. Drive from Westport to Dublin, if you are dropping off your Dublin Airport car hire, follow the signs to Fingal on the M4 motorway and take the exit 2 from M1. Please be advised this route has a toll. There is so much to see and do on the Wild Atlantic Way; you should never be downhearted if you only make it so far. So relax, visit where you want, see what you want. Ireland’s stunning Atlantic coastline isn’t going anywhere; the rest will still be there for you next year. If you would like to book car rental for your Ireland road trip, please click here.